By LUDWIG VON KOOPA - And he's not getting charged. George Zimmerman rides again! Last month, we gave hugely concerning news: George Zimmerman got arrested within the first two weeks of 2015! He was supposed to be in court on February 17, and you better believe that we were going to cover it. "But this morning the State Attorney's Office reported that the woman, Zimmerman's roommate and dental hygienist, 28-year-old Brittany Brunelle, had recanted her story and refused to cooperate. As a consequence, it is dropping the case." "When they issued a subpoena, she did appear with her attorney and either told them or handed them a statement saying that Zimmerman had not thrown a bottle at her and that she never feared him, the statement said." KoopaTV and its staff have a track record of being incredible, including predicting things (or having insider knowledge). This one wasn't a big deal. The Orlando Sentinel never mentioned whether or not the unidentified girlfriend, who is actually Brittany Brunelle, actually ever got the traffic ticket. Props to Rawk for not only having Zimmerman party as a result of being free, but also have him now have to collect stamps after said party. You know what kind of stamps those really are? Food stamps. 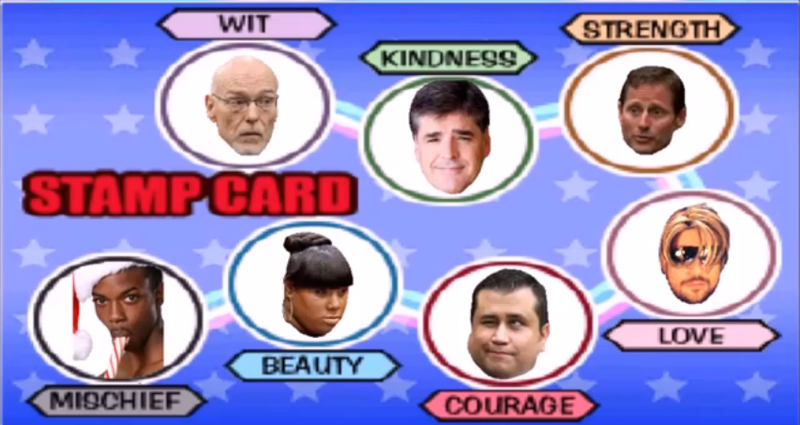 From Wit to Mischief: Don West (Zimmerman's attorney), Sean Hannity (Fox News host), Adam Pollock (Zimmerman's personal trainer, along with Little Mac's), Robert Zimmerman Jr. (Zimmerman's brother), George Zimmerman (American hero), Rachel Jeantel (Trayvon Martin's not-girlfriend, wet-grass whisperer, and Denny's restaurant customer), and Jaffa (Zimmerman trial virtual troll). Still, Zimmerman is now free once more from false charges. He has a long history of those, with previous girlfriends also accusing him of domestic violence. Those got dropped, too. We can only speculate what becomes of Zimmerman now. A year of peace and prosperity? 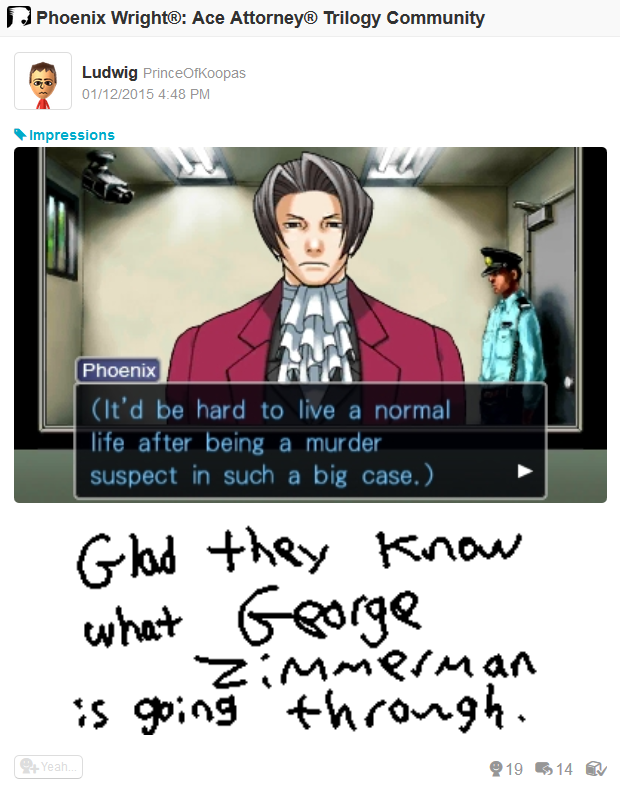 Miles Edgeworth and George Zimmerman are going through the same stuff. Ludwig was looking forward to another Zimmerman trial, but he's happy that George Zimmerman is innocent of any wrong-doing. Follow Ludwig on Miiverse at NNID PrinceOfKoopas. Just because. KoopaTV will give you the latest coverage on George Zimmerman's life as it happens, so stay tuned! George Zimmerman's year continues to grow brighter as the civil rights charge against him is removed.